Click here to go to my STAMPtember post! Good morning!!! 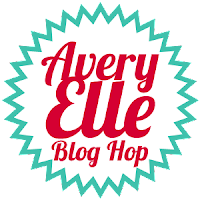 It's Avery Elle Blog Hop day and I'm sharing some new stamps and dies I designed for the October/November release:) My new designs are add-ons to the Fill in the Blank stamps and dies from the last release. The new Holiday Fill in the Blank stamps and Holiday Fill in the Blanks dies let you make all kinds of quick and fun holiday cards:) Here's a look at the full sets (they are already up on the Avery Elle site by the way;). Every year I try to send handmade Christmas cards, but it's difficult striking a balance between keeping it handmade and not taking 3 months to finish your holiday cards;) So each year I try to come up with something quick and easy to replicate but still a bit different than what you'd see at the local Hallmark. This time I went modern and CAS with a gray (Fog) card stock base. I glammed it up a bit with a strip of silver along the left side. The rest is just a matter of die cut and filling in the blanks:) Maybe this year, I'll actually be able to get my cards done on time! 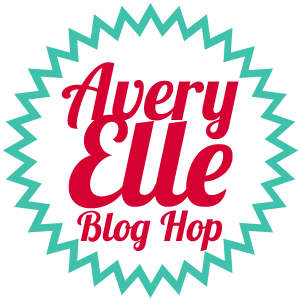 To celebrate the October/November Release Blog Hop, Avery Elle is giving away a $25 Gift Certificate to one random winner! To enter to win just comment on this post. There is no purchase necessary and you must be 18 years of age or older to enter. This giveaway is void where prohibited. You can also do options 2, 3, 4, 5 or all 6 of the following to increase your chances of winning. You have until midnight Sunday, September 29th to enter. The winner will be announced on the Avery Elle Blog on Monday, September 30th. All products are available for purchase in the Avery Elle store right now. What a beautiful card! I love the way you used color and the "merry" die. what a cool card.. i totally love it..
You are one clever chica, you know that right? Love the graphic nature. JJ- This card is terrific and so "you". I love it. Thanks so much for the inspiration each and every week! You are amazing. You are so clever, JJ! LOVE this card! Love the pop of red with the gray and white. Thanks for sharing! ack!!!!!!!! awesome!!!! so so so smart!! LOOOOOVE the pops of red and amazing color choices!! this is so cool!! What a creative way to use these new products. Love it. Sooo COOL and very CLEVER! LOVE this a lot JJ!!! I love the fill-ins! This is such an awesome card! Very cute and oh so creative. Congrats on another great release, JJ! Your card is so clever, and perfect for mass producing...I love it! Wow! Another incredible design JJ! What a great card! Seriously, what is not to love? You are a master at well-designed cards, JJ. The gray, the shine, and of course the sentiment. All wonderful!!!! this is so cool, JJ!! You are just too clever! Love it!! Clever, beautiful card! Love how it's simple, yet eye-catching! Love the new stamps and dies! Very fun card! Love it! What a clever and fun card! I like what you did with this die. I don't think I would have thought to use it this way. Nice design! Love your new release! Sweet heaven.....this is amazing die work JJ! I love the inlaid red "MERRY"!!! I sent you a message on FB! Wow how do you think up these creative ideas...LOVE this card! What a beautiful card... And a great bunch of stamps/dies this release. so simple and so creative! Fabulous stamps & dies! 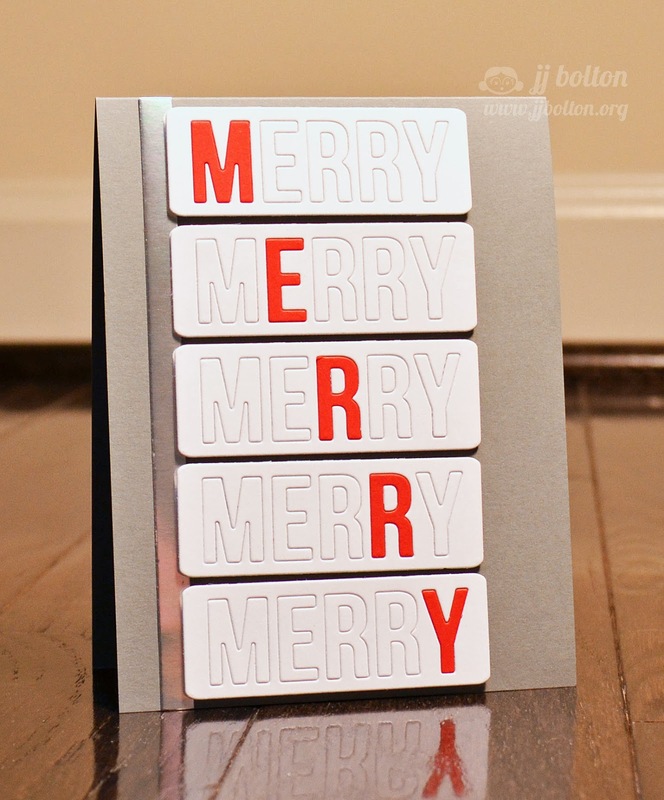 Love your card--such a creative way to showcase the dies! The merry card is just so cute! Love this new set! And I just love the card that you,...you are so inspiring! You are so clever!! What a fantastic card, simple and unfussy..just perfect!! Such a fun way to use the die! I love the gray and the bit of metallic cardstock! Wow, this is stunning! 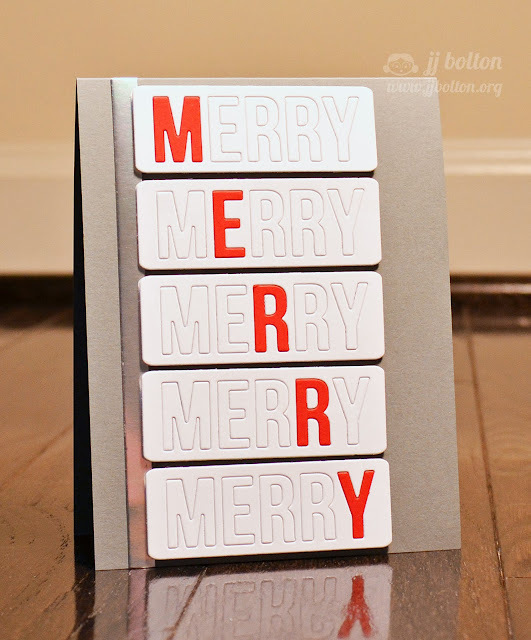 Great idea for holiday cards!! it's my fave so far on the hop! Cards don't have to be overly-fussy. This one says what you want it to say and is still pretty. Thanks for sharing. Oh my gosh - I LOVE this! It has a CAS appearance but well all KNOW it took a while to cut out all those dies and pop a few of the letters out and replace them with red ones. Looks terrific! And that shiney silver strip really pulls it all together! I LOVE how you did this card! So fantastic! Thank you for sharing! What a great CAS design which is perfect for making multiples. Love it! Great card - I love the repeating element - I would have never thought of that! Your cards are so clever. The card is so graphic and bold. Fabulous! nice, simple design. Inspires me to get out my alphabet dies! WOW, Brilliant use of the dies. Love the graphic design! This is super fun!! Great job! This stamp set and die set are genius! Plastic business cards or even a unique crystal clear plastic material cards to the bag with all your buyer's acquire is really a low-cost, low-tech strategy to create visitors and also duplicate small business.